Made in San Antonio, Texas from recycled fleece jackets and plastics. Lightweight and protective tablet case. Select desired colorway (exact shade will vary). Dimensions: 10.25" x 8.4" x 0.75"
When will this be made available for the iPad Pro? Stylish and upcycled - love it! My I pad cannot be charged in this awesome sleeve. It would be perfect if my bottom connector could be accessed as stated for charging. Nope can t do it. I was hoping it was a working sleeve, but it is a storage sleeve. It is very firm and safe for my iPad II. The main feature I was excited about with this product was that it could charge WHILE my iPad was in the sleeve. IT CANNOT!!! Sustainability isn’t just a buzzword to Sam Palmer and Jennifer Feller. It’s a defining principle that permeates every aspect of their design business. Sam and Jennifer create products using a new kind of upcycled felt they call ReFleece. The only virgin materials used in their iPad and Kindle cases are thread for sewing and elastic bands or snaps for the enclosure. Everything else is recycled content. The outer, gray layer is ReFleece, which is made from post-industrial recycled fleece scrap. The inside, colored layer is a piece of an old fleece jacket. ReFleece washes the jackets (collected through Patagonia's Common Threads Initiative) and cuts them into squares to line its cases. 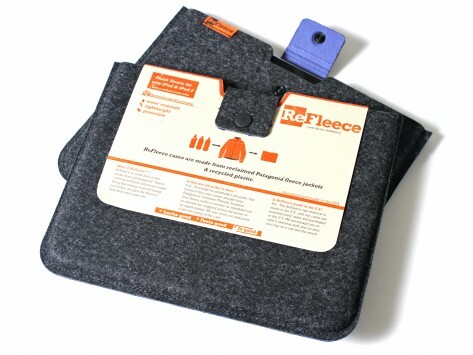 The ReFleece raw material is made in the U.S., and the cases are manufactured, sewn and packaged in the U.S., too. That means Sam and Jennifer don’t have to ship the reclaimed jackets overseas for processing, which many recycling practices require. The husband-and-wife team also has worked hard to make their manufacturing process as low energy as possible (they use a pressing process rather than the high-heat re-melting routine that’s typical of fleece recycling). Smart design is equally important to Sam and Jennifer. They’ve combined their experience working in the design, outdoor and solar industries to create streamlined, functional cases that protect your electronic devices and look great doing it. Traces of past adventures and life experiences are woven into every bit of fabric and recycled materials -- and they’re ready for more action.